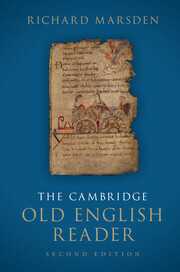 Preface to the second edition; Preface to the first edition; List of abbreviations; Introduction; Beginning Old English; 1. Getting started; 2. Practice sentences; 3. Practice texts; 4. Keys to test sentences and texts; 5. Beginning poetry; The Texts: Part I. Teaching and Learning: 1. In the Schoolroom (from Ælfric's Colloquy); 2. A Personal Miscellany (from Ælfwine's Prayerbook); 3. Medicinal Remedies (from Bald's Leechbook); 4. Learning Latin (from Ælfric's Excerptiones de arte grammatica anglice); 5. A New Beginning (Alfred's 'preface' to his translation of Gregory's Cura pastoralis); 6. The Wagonwheel of Fate (from Alfred's translation of Boethius's De consolatione Philosophiae); Part II. Keeping a Record: 7. Laws of the Anglo-Saxon Kings; 8. England under Attack (from the Anglo-Saxon Chronicle: annals for 981–93, 995–8 and 1002–3); 9. Bede's Ecclesiastical History of the English People; 10. The Battle of Brunanburh; 11. The Will of Ælfgifu; 12. The Fonthill Letter; Part III. Spreading the Word: 13. After the Flood (from the Old English Hexateuch: Gen 8.6–18 and 9.8–13); 14. The Crucifixion (from the Old English Gospels: Mt 27.11–54); 15. King Alfred's Psalms; 16. A Translator's Problems (Ælfric's preface to his translation of Genesis); 17. Satan's Challenge (Genesis B, lines 338–441); 18. The Drowning of Pharaoh's Army (Exodus, lines 447–564); 19. Judith; Part IV. Example and Exhortation: 20. Bede's Death Song; 21. Two Holy Women; 22. A Homily for Easter Sunday (from Ælfric's Sermones catholicae); 23. The Dream of the Rood; 24. On False Gods (Wulfstan's De falsis deis); 25. The Sermon of the Wolf (Wulfstan's Sermo Lupi); 26. The Seafarer; Part V. Telling Tales: 27. Falling in Love (from Apollonius of Tyre); 28. The Trees of the Sun and the Moon (from The Letter of Alexander); 29. Cynewulf and Cyneheard (from the Anglo-Saxon Chronicle: annal for 755); 30. The Battle of Maldon; 31. Beowulf; 32. The Fight at Finnsburh; Part VI. Reflection and Lament: 33. Truth is Trickiest (Maxims II); 34. The Durham Proverbs; 35. Five Anglo-Saxon Riddles; 36. Deor; 37. The Ruin; 38. The Wanderer; 39. Wulf and Eadwacer; 40. The Wife's Lament; Manuscripts and textual emendations; The writing and pronunciation of Old English; Reference grammar of Old English; Glossary; Guide to terms; Index. "… this remains an invaluable reader …"